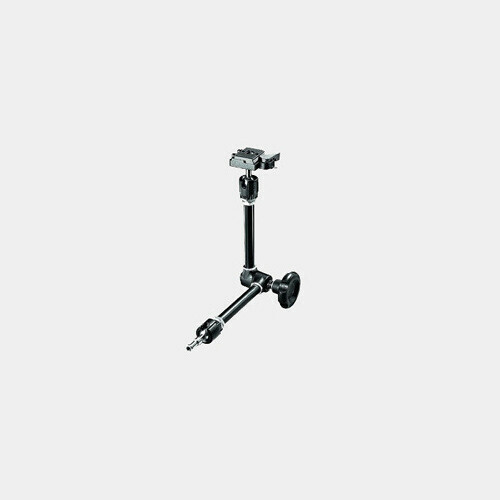 The Manfrotto Variable Friction Magic Arm with Quick Release is a fully articulated arm with 90° pivotable and 360° rotatable ends, and an elbow that rotates 360°. Its camera platform has a quick release mechanism and removable camera plate. The camera plate a a 1/4"-20 thread. 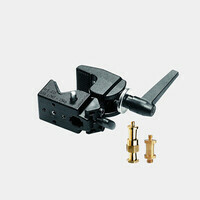 The knob allows partial loosening for safe and precise positioning of a light head or camera. It has 5/8" studs on ball joints at both ends with 3/8 and 1/4" female threads. Although it is supplied with a quick-release camera platform, it requires a Super Clamp or Base (available separately) for use.